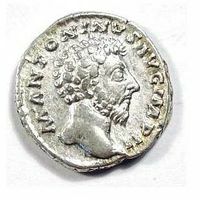 Marcus Aurelius Antoninus Augustus (Rome, April 26, 121 – Vindobona or Sirmium, March 17, 180) was Roman Emperor from 161 to his death in 180 . 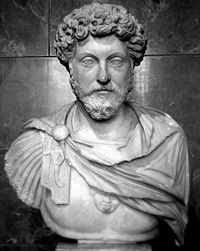 He was the last of the "Five Good Emperors", and is also considered one of the most important stoic philosophers. 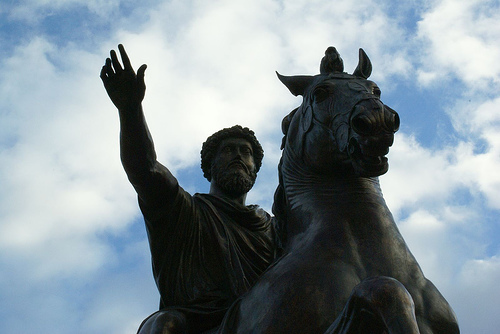 This blog was not authored by Professor Sugrue but the YouTube videos poster here are films of his lectures that make a great accompanyment to the Meditations of Marcus Aurelius. Michael Sugrue is the Behrman Fellow in the Council on the Humanities at Princeton University. A graduate of the Great Books Program, he received his B.A. in history at the University of Chicago and went on to earn his M.A., M.Phil., and Ph.D. in history from Columbia University. 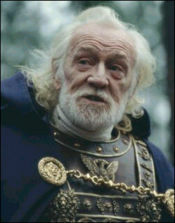 Prior to taking his position at Princeton, Professor Sugrue taught at the City College of New York, Columbia University, Manhattan College, New York University, Hampton University, and Touro College. He served as the Mellon Postdoctoral Fellow at the Johns Hopkins University from 1992 to 1994. He has been awarded the Chamberlain Fellowship, the President’s Fellowship, the John Jay Fellowship, and the Meyer Padva Prize.